Despite its grandeur and rich exterior ornamentation, the Javanese abandoned Prambanan within 100 years of its completion around c. 950 CE. Prambanan (Javanese: Rara Jonggrang) is a Hindu temple complex dating from the 9th century CE located near Bokoharjo, on the island of Java in Indonesia. Prambanan is the largest Hindu temple in Indonesia and one of the largest Hindu temples in Southeast Asia. 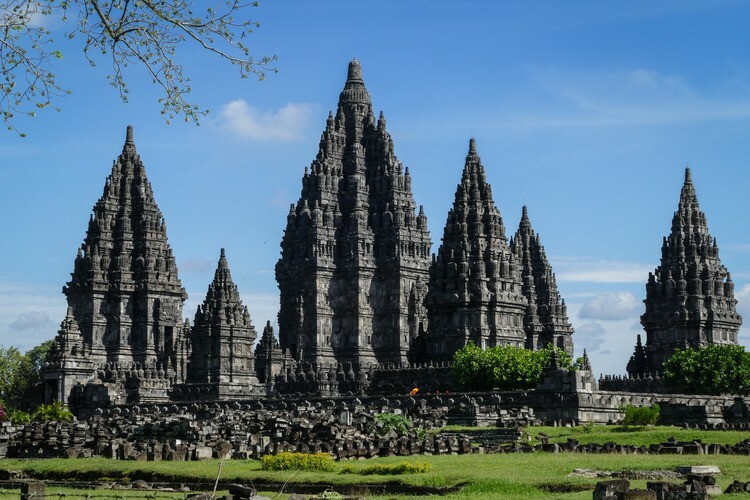 Dedicated to the Trimurti of Hinduism — Brahma, Vishnu, and Shiva — Prambanan’s architecture conforms to Hindu architectural traditions based on the Vastu Shastra, and the temple thus reflects the Hindu conceptions of the cosmos in its design and layout. Despite its grandeur and rich exterior ornamentation, the Javanese abandoned Prambanan within 100 years of its completion around c. 950 CE. Although the ravages of time and natural disasters took their toll on Prambanan, the Javanese never forgot the ruins, and Prambanan continued to play a part in Javanese folklore. Research and the restoration of Prambanan began in earnest in the early 20th century CE, and the temple complex was declared a UNESCO World Heritage Site in 1991 CE. It is today one of the most visited historical sites in Indonesia. Prambanan is located some 17 km (11 miles) northeast of the Indonesian city of Yogyakarta, near the border between the two provinces of Yogyakarta and Central Java, on the island of Java. The ruins themselves lie 0.5 km south of the village of Prambanan. The period in which the Javanese constructed Prambanan and neighboring temples is shrouded in legend and mystery. Strong cultural and religious influence arrived in what is now present-day Indonesia from the Indian subcontinent, beginning around the 1st century CE. This influence grew rapidly from c. 400 CE onwards. Hindu and Buddhist merchants and traders, settled in the region, intermarried with the local population, and facilitated long-distance trade relations between the indigenous Javanese, ancient India, and the rest of Southeast Asia. Over the centuries, the Javanese blended the culture and religions of ancient India with their own. Some historians contend that Prambanan’s construction began under the orders of King Rakai Pikatan (r. 830-860 CE?) at some point between c. 840-850 CE. Rakai Pikatan oversaw the construction and design of the main temple complex, while other structures were built soon thereafter by later kings, including Rakai Kayuwangi (r. 850-898 CE), Balitung (r. 899-911 CE), Daksa (r. 910-919 CE), and Tulodong (r. 919-924 CE). At some point, locals diverted a nearby river to flow past the temple complex as well. Rakai Pikatan and his successors belonged to the Hindu Sanjaya dynasty, which was the rival of the Buddhist Sailendra dynasty for power in the “Medang” or Mataram kingdom in central Java. 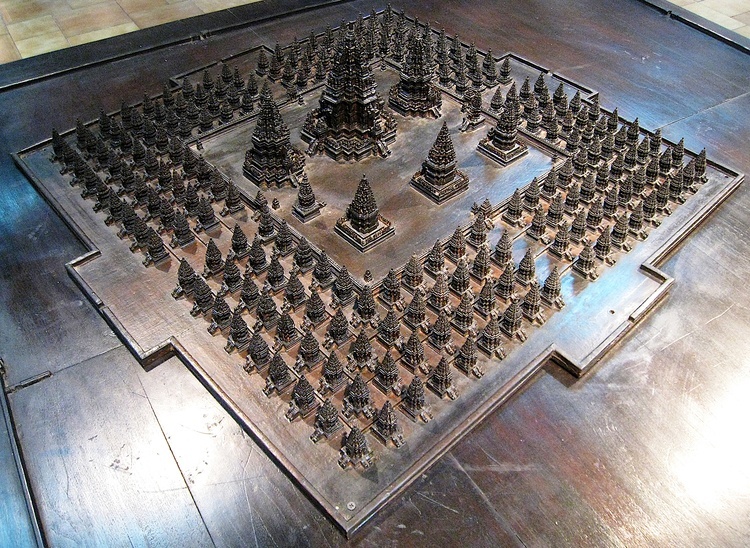 It is worth noting that the Sailendra dynasty oversaw the construction of the Buddhist temple of Borobudur. As Borobudur is located only 19 km (12 miles) from Prambanan, some scholars interpret Prambanan’s genesis as a direct artistic, political, and religious response to that of Borobudur and in turn the competitive Sailendra dynasty. It is even said that Rakai Pikatan’s wife, Princess Pramodhawardhani (fl. 820-860 CE), was the daughter of King Samaratungga (r. 812-833 CE) who may have overseen Borobudur’s construction. (Despite all this, other Javanese historians see the “Sailendra” and “Sanjaya” dynasties as one and the same family, interpreting the religious patronage of Buddhism or Hinduism as the result of a ruler’s personal belief). According to ancient Khmer sources, King Jayavarman II (r. 802-835 CE), the founder of the Khmer Empire (802-1431 CE), spent much of his life in Java, and was appointed by Samaratungga as the governor of Indrapura, which later became the capital city of Champa around c. 875 CE. It is said that Jayavarman visited both Borobidur as well as Prambanan, which inspired him to build the city of Angkor Wat on a grand scale. This is quite possible as the Sailendra and Sanjaya dynasties exerted much political and cultural influence through their thalassocracies in what is present-day Java, Sumatra, Malaya, and southern Cambodia in the 8th, 9th, and 10th centuries CE. Prambanan’s abandonment mirrors that of nearby Borobudur. As the center of political power shifted from central to eastern Java under the reign of King Mpu Sindok (fl. 928 CE), Prambanan became less important politically and culturally to the ancient Javanese. The Sanjaya dynasty had successfully usurped power from the Sailendra dynasty, leaving the island of Java under their near complete suzerainty. Volcanic eruptions from Mount Merapi in the 10th century CE and countless earthquakes may have impacted Prambanan’s appeal as a place of worship and pilgrimage as well among the Hindu faithful. Over time, Prambanan deteriorated and became surrounded by a dense jungle. The Dutch explorer C. A. Lons reported his “rediscovery” of Prambanan in 1733 CE to Dutch colonial officials, but the temple was never completely forgotten by the Javanese in their histories, myths, and legends. A very popular Javanese legend is that of Rara Jonggrang, which is set in Prambanan and its neighboring temples. In the legend, a Javanese princess is turned to stone by her cruel husband. 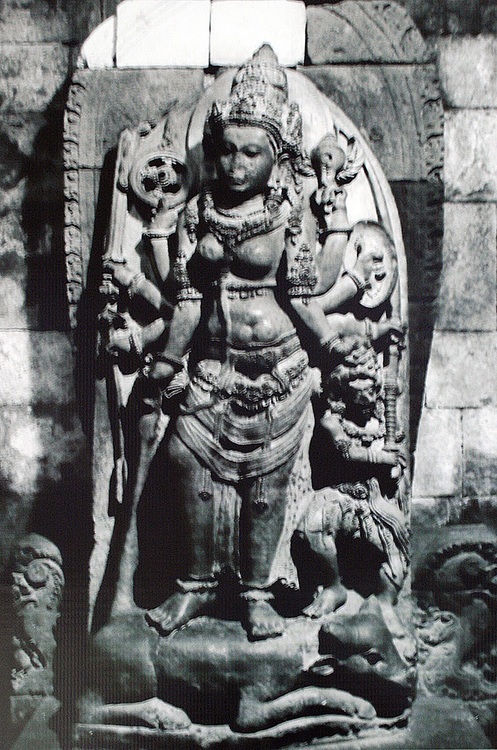 The princess is said to be beautiful image of the Hindu goddess Durga located within the north wing of Shiva’s temple at Prambanan. Restoration work began in 1885 CE, but accelerated in 1918 CE. These efforts were halted when Indonesia was invaded in 1941 CE by the Japanese during World War II. In 1953 CE, the Temple of Shiva was reconsecrated to Hindu believers, and Prambanan was restored once again following the 2006 CE Yogyakarta earthquake. Intermittent archaeological excavation and restoration continue in and around Prambanan today. Set in the fertile Prambanan Plain, Prambanan is but one of 30 temples built between c. 750-950 CE in a 30 square km (11.5 square miles) area. Lying just a few kilometers to Prambanan’s north are three ancient Buddhist Temples built in the 8th century CE — Lumbung, Bubrah, and Sewu — while 2.5 km to Prambanan’s south and southeast lie the ruins of the 9th-century CE Buddhist temples of Ratu Boko and Sojiwan, respectively. Some 3 km to Prambanan’s west are also the 8th-century CE Buddhist Sari Temple, the Kalasan Temple, which dates to c. 778 CE, and the Sambisari Temple, which dates from the 9th century CE and is dedicated to Shiva. Prambanan consists of six temples all situated in an elevated courtyard, which is in turn encompassed by 224 minor temples now ruined. The greater the distance a temple is from the main complex, the smaller it is in height and space. A small wall surrounds the smaller temples, just as a large wall encompasses the main complex. Prambanan has a 47 m (154 ft) tall central temple — dedicated to Shiva — which sits inside a complex of other temple structures in a concentric mandala layout. Prambanan, in ways similar to Borobudur, delineates the celestial hierarchy and transposes them to three distinct temple zones. Horizontally and vertically, Prambanan exudes Hindu conceptions of heaven. The largest three temples, the holiest sites within the main complex, are dedicated to the triad of Hindu gods. Shiva’s temple is the most prominent with Brahma’s temple lying to the south of Shiva’s temple, and Vishnu’s temple lying to the north of Shiva’s temple. Directly parallel to these magnificent temples are three smaller temples, each dedicated to mythological animal figures that provide protection, companionship, and transportation to the aforementioned gods: Garuda, a mythical winged creature, Hamsa the swan, and Nandi the bull. The Temple of Shiva is the most ornate of the three massive temples, containing a series of elegant carvings along the inner wall, which depict the scenes from the ancient Indian epic The Ramayana. This temple contains four rooms, including an inner sanctuary with a statue of Shiva, while another chamber near the inner sanctuary contains a large statue of Shiva’s son, Ganesha. The southern room of Shiva’s temple is dedicated to Batara Guru who, according adherents of Javanese Hinduism, is an avatar of Shiva that gives prophecy, presents, and other human abilities. There is also a statue of the sacred bull calf, gatekeeper, and vehicle (vahana) of Shiva, Nandi, which sits in front of the Temple of Shiva. The walls in the Temple of Brahma continue the narration of The Ramayana, while the Temple of Vishnu is decorated with carvings retelling the epic battles of Krishna along its terrace. Coedes, G. The Indianized States of Southeast Asia. (University of Hawaii Press, 1968). Leeming, David. A Dictionary of Asian Mythology. (Oxford University Press, 2001). Leeming, David. Oxford Companion to World Mythology. (Oxford University Press, 2009). Melton, J Gordon. The Encyclopedia of Religious Phenomena. (Visible Ink Press, 2007). Olsen, Brad. Sacred Places Around the World. (CCC Publishing, 2004). Tiffin, Sarah. Southeast Asia in Ruins. (National University of Singapore Press, 2017). Widyono, Benny. Dancing in Shadows: Sihanouk, the Khmer Rouge, and the United Nations in Cambodia. (Rowman & Littlefield Publishers, 2007). Originally published by the Ancient History Encyclopedia, 09.26.2018, under a Creative Commons: Attribution-NonCommercial-ShareAlike 3.0 Unported license. This entry was posted in Uncategorized and tagged Hindu, History, Indonesia, Java, Medieval, Middle Ages, Prambanan. Bookmark the permalink.